Do you have a LinkedIn profile simply because you feel you ought to? Or, have you been meaning to set one up, but don’t know where to start? Chances are, even more advanced users of LinkedIn are not maximizing the platform to its fullest. With careful curation, it can be one of the most powerful tools in your arsenal, enabling new opportunities, driving new business and partnerships, and giving you the power to position yourself as a thought leader in your space. In this workshop, LinkedIn novices and vets alike will learn quick wins and ninja tricks to get LinkedIn to do the heavy lifting. Hear how to increase your profile strength, strategically grow your network, boost your search value, and much more. Discover how investing less than an hour per week can pay big dividends in achieving your personal and professional aspirations. Amanda Healy is an award-winning marketing demand generation leader, national speaker and keynote, and social media advocate. She currently works as a Senior Marketing Manager at TIBCO Software, driving global campaigns for the company’s enterprise integration and cloud solutions. She has trained world-class teams ranging from startups to Fortune 500 companies to leverage social media, and has spoken at industry-leading conferences including the Massachusetts Conference for Women, the Women In Technology International Summit, Microsoft Envision, Social Tools Summit, Watermark’s Lead On Conference for Women, and many more. 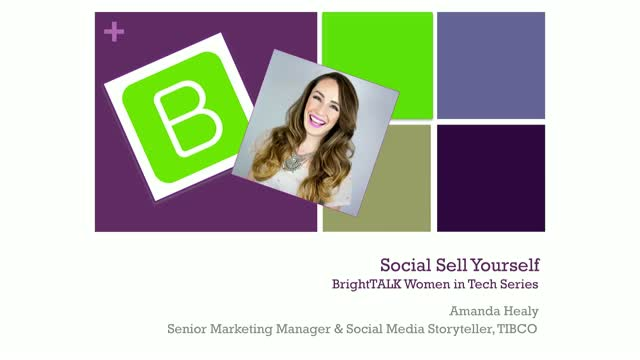 Profiled by the Washington Post, interviewed by WBZ, lauded as “Social Genius” by the Boston Social Tools Summit, and named to BostonSpeak’s “24 Experts On How to Become a Great Public Speaker” list, Amanda is one to watch.